Installation view. Photo by Jordan Kleinman. Installation view. Photo by Drew Dies. Klein Sun Gallery is pleased to announce its ten year anniversary exhibition: Referencing Alexander Calder: A Dialogue in Contemporary Chinese Art, on view from September 7 through October 7, 2017. Curated by Eli Klein, the exhibition includes selected works by Gao Ludi, Hong Hao, Hong Shaopei, Huang Rui, Jiang Pengyi, Li Jingxiong, Qin Jun, Shen Fan, Vivien Zhang, Yangjiang Group, and Zhao Yao. The gallery’s inaugural exhibition in 2007 Referencing Alexander Calder: A Dialogue in Modern and Contemporary Art consisted of unique works by modern artists such as Alexander Calder, Pablo Picasso, Joan Miró and Fernand Leger juxtaposed with the works of living artists such as Carmen Herrera, Joel Perlman, Monique Van Genderen and Amilcar de Castro. The overarching theme of the exhibition was Calder's art and its massive influence on his peers and contemporary artists. As a leader in the representation of Chinese contemporary art in the US for the past decade, Klein Sun Gallery now revisits its inaugural show. In ancient China, wind chimes were a fundamental part of Feng Shui where balances between Yin and Yang, flexibility and solidity, and movement and stability, were crucial. Alexander Calder is widely acknowledged as the originator of mobiles, a format within which he found a similar type of balance between the living and the mechanical. Calder encountered Chinese wind bells in his youth in San Francisco, influencing him from an early age. Calder has been a central figure in the chain of modern artistic legacies. His visit to Piet Mondrian’s studio in 1930 had an immense imprint on the maturation of his style, the sweeping linear gestures in Calder’s mobiles later became the inspiration of a number of modern and contemporary masters such as Jackson Pollock and Willem de Kooning. Whereas Calder’s influence on western artists has been well-documented, the reach of his influence into China has rarely been discussed. 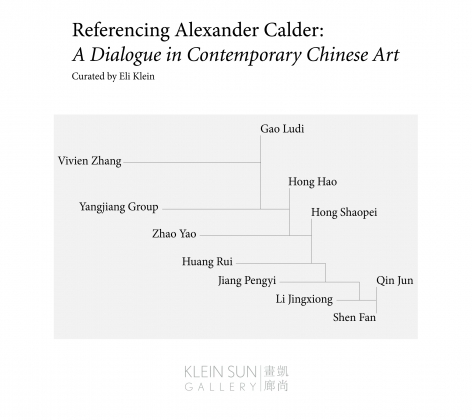 For Referencing Alexander Calder: A Dialogue in Contemporary Chinese Art, the eleven Chinese contemporary artists chosen are those whose works show substantial influence from the lexicon created by Calder and his peers. Just as Calder amazed the world by ingeniously incorporating kineticism into his works in the 1930s, these Chinese artists showcase a similar degree of innovation. In recent years, they have each shaken the global artistic landscape, applying their unique eastern understanding towards ‘movement’, ‘quiescence’, ‘tendency’, and ‘balance’. Mobiles, stabiles and graphic works are the three main carriers of Calder’s legacy, each a style of reference in this exhibition. Li Jinxiong’s EGOBY (2014-2016), hung interlaced in the south gallery, shares the appearance and physical traits of Calder’s Hanging Mobiles, yet applies them to illustrate the concept of male dominance in the contemporary world. On the other hand, Huang Rui’s steel sculptures, Auspiciousness (2014), Cat (2015), Monkey (2015), and eYe (2014) are firmly connected to Calder’s stabiles. They not only share similarity in material and presence, but also bear the intriguing fact that these sculptures appear completely differently when viewed from different angles. What from one standpoint may resemble a monkey can from another angle appear to be an abstract figure. Comparable to Calder’s graphics, works of Zhao Yao, Hong Hao, Qin Jun, Hong Shaopei and Gao Ludi seek modernization in both color and composition. An additional element which influenced Calder’s works was the concept of flow. Works on display by artists Yangjiang Group, Shen Fan and Jiang Pengyi provide a unique oriental twist to this crucial aspect of Calder’s oeuvre. Yangjiang Group’s sculpture utilizes wax as a unique medium to capture a snapshot of the spontaneity when wax is melted. Shen Fan’s work extracts the essence of traditional Chinese Shanshui (mountain and water) paintings to create a minimalist comparison between rock and liquid. Confronting the definition of mobile as an object that moves, and stabile as an object that doesn’t move, Vivien Zhang’s Cursory Eddy (2017) comprises otherworldly portraits that exhibits a sense of movement on a canvas that stays stationary. The exhibition is accompanied by a fully illustrated catalogue with an essay by Eli Klein. For press inquiries please contact Alexandra Goldman at the gallery (212.255.4388) or via email at alexandra@kleinsungallery.com. For all other inquiries, please contact Phil Cai at the gallery (212.255.4388) or via email at phil@kleinsungallery.com.